Read Testimonials from Satisfied Teachers, Administrators and School Personnel. Buy Student Accident Insurance Quickly with Our Easy Online Portal. 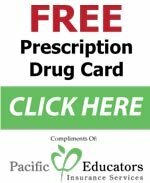 Pacific Educators is one of California’s oldest and largest providers of employee benefits to education/school personnel and their families. Our focus is to provide the highest quality Life Insurance, Disability Insurance, and Cancer Insurance available to California Teachers, California School Employees (Classified) and California Administrators/Management. All of our products are from reputable, top-rated insurance companies. For over 42 years, we have made available a variety of insurance coverages designed especially for California School District Personnel, their friends, and families. We also work closely with many Colleges and Educational Groups. In most cases payroll deduction is available. Since 1971, Pacific Educators’ staff has developed the skill and knowledge to provide our clients with complete, comprehensive, affordable insurance protection. Our long and special relationships with our insurance carriers enable us to provide our customers with the first class service they deserve. Best of all, when you call us with questions or concerns, you’ll receive prompt human attention, not the voice mail run-around. Contact a plan advisor today.